This specification defines a concrete sensor interface to monitor the rate of rotation around the device’s local three primary axes. This document was published by the Devices and Sensors Working Group as a Working Draft. This document is intended to become a W3C Recommendation. If you wish to make comments regarding this document, please send them to public-device-apis@w3.org (subscribe, archives). When sending e-mail, please put the text “gyroscope” in the subject, preferably like this: “[gyroscope] …summary of comment…”. All comments are welcome. The Gyroscope API extends the Generic Sensor API [GENERIC-SENSOR] to provide information about the angular velocity around the device’s local X, Y and Z axis in terms of radian per seconds units. The use cases and requirements are addressed in the Motion Sensors Explainer document. Sensor readings provided by inertial sensors, such as gyroscope, could be used by adversaries to exploit various security threats, for example, keylogging, location tracking, fingerprinting, user identifying and even eavesdropping. The [TOUCHSIGNATURES] research paper proposes that implementations can provide visual indication when inertial sensors are in use and/or require explicit user consent to access sensor readings. These mitigation strategies complement the generic mitigations defined in the Generic Sensor API [GENERIC-SENSOR]. The Gyroscope sensor type’s associated Sensor subclass is the Gyroscope class. The Gyroscope has a default sensor, which is the device’s main gyroscope sensor. The Gyroscope has an associated sensor permission name which is "gyroscope". A latest reading of a Sensor of Gyroscope sensor type includes three entries whose keys are "x", "y", "z" and whose values contain current angular velocity about the corresponding axes. The angular velocity is the rate at which the device rotates about a specified axis in a local coordinate system defined by the device. Its unit is the radian per second (rad/s) [SI]. The sign of the current angular velocity depends on the rotation direction and it must be according to the right-hand convention in a local coordinate system defined by the device, such that positive rotation around an axis is clockwise when viewed along the positive direction of the axis (see figure below). The local coordinate system represents the reference frame for the Gyroscope readings. It can be either the device coordinate system or the screen coordinate system. To construct a Gyroscope object the user agent must invoke the construct a gyroscope object abstract operation. Supported sensor options for Gyroscope are "frequency" and "referenceFrame". The x attribute of the Gyroscope interface represents the current angular velocity around X-axis. In other words, this attribute returns the result of invoking get value from latest reading with this and "x" as arguments. The y attribute of the Gyroscope interface represents the current angular velocity around Y-axis. In other words, this attribute returns the result of invoking get value from latest reading with this and "y" as arguments. The z attribute of the Gyroscope interface represents the current angular velocity around Z-axis. In other words, this attribute returns the result of invoking get value from latest reading with this and "z" as arguments. Let allowed be the result of invoking check sensor policy-controlled features with Gyroscope. Let gyroscope be the new Gyroscope object. Invoke initialize a sensor object with gyroscope and options. 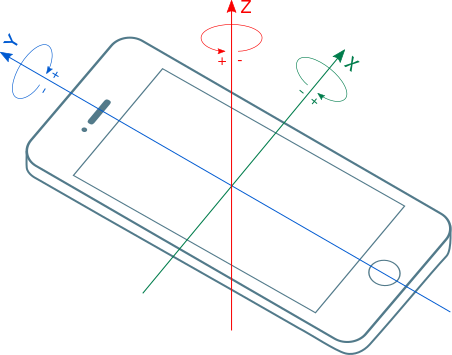 Define local coordinate system for gyroscope as the screen coordinate system. Otherwise, define local coordinate system for gyroscope as the device coordinate system. This section extends the automation section defined in the Generic Sensor API [GENERIC-SENSOR] to provide mocking information about the rate of rotation around the device’s local three primary axes for the purposes of testing a user agent’s implementation of Gyroscope API.